High purity flow path. Superior repeatability, stability and response time. 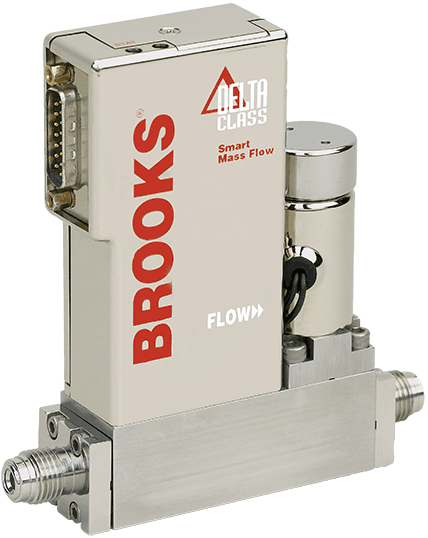 The Brooks model SLA7840 is a high purity metal sealed instrument that controls pressure while measuring flow rate. A remote pressure transducer signal, along with adjustable integral PID control electronics and a co-planar control valve, maintains the desired set pressure. The co-planar valve reduces sensitivity to pressure variations and offers lower leak-by rates compared to other metal sealed controllers ensuring a more stable process over time. Any range from 0 to 3 sccm to 0 to 30,000 sccm N2 Eq. ±1% of rate 20-100% F.S. ±0.2% F.S. < 20% F.S. Dependent upon remote pressure transducer, maximum 500 psig. < 1 sec typical for a 20-100% setpoint step with max 2% overshoot.